South Lake Tahoe spans both the California and the Nevada sides of the lake. It includes South Tahoe, Ca and Stateline, Nv. Tahoe Keys is a very exclusive community which is ideal for boaters since you can bring your boats through the keys and right up to your backyard. Just south of this area is the small town of Meyers and further south is Kirkwood. 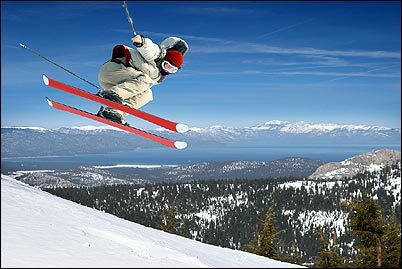 South Lake Tahoe offers fantastic skiing at the Heavenly Ski Resort which comes right down into town. After a long day on the slopes you can enjoy a great night out in the casinos of South Lake Tahoe. Enjoy Harrahs, Caesars Palace, and the Horizon Resort just to name a few. After a day of activity and a night of fun you can retreat to one of the many South Lake Tahoe Vacation Rental options. Stay right on the lake, have ski in / ski out accommodations at Heavenly or rent in the Tahoe Keys community and bring your boat right to your back door. Please search our list of South Lake Tahoe Vacation Lodging and Vacation Rentals.